The newly announced OnePlus 5T is a great smartphone that comes with top-of-the-line specs, a bezel-less design, and an affordable price tag. More handset manufacturers are pricing flagships closer to the $1000 mark then ever before, making a sub-$500 handset a bit of a rarity. So how does the OnePlus 5T stand against the competition, and who exactly is it competing against? Good question. While the OnePlus 5T competes against today’s more expensive flagships fairly well, the real race will be between OnePlus and other Chinese OEMs, as well as older flagships from the first half of 2017. One such would-be competitor is the LG G6. Despite being well over a half year old, the LG G6 is still a great handset with a price that continues to drop as newer devices arrive on scene. So how do the OnePlus 5T and LG G6 compare? Let’s find out. The 5T doesn’t try to dazzle you with over-the-top design features but it’s still a gorgeous device. Like the rest of OnePlus’ lineup, the smartphone is all about simplicity. This is echoed by the fact the phone is only offered in one color, black. The 5T follows the latest design trend, featuring thin bezels around the screen (a first for OnePlus). This gives it a clean look, especially since there’s no branding on the front. It has an aluminum unibody construction for a premium look and feel. The OnePlus 5T also sports rounded corners and edges to make it sit better in the hand. The back of the device more or less looks identical to the OnePlus 5, as you’ll find a dual-camera setup in the upper left corner along with the flash module. The OnePlus logo sits a bit further down this time, in the middle of the phone. The major difference between the 5T and its predecessor is that the fingerprint scanner has now moved to the back, as there’s not enough room up front anymore. Looking around the phones sides, you’ll find a power button on the right and a volume rocker with an alert slider on the left. The LG G6 is also a stunner with it’s bezel-less design. The front of the device isn’t as clean looking due to the LG logo below the display. Unlike the OnePlus 5T, the handset has a glass back which looks and feels just as premium as metal. Of course, using glass could lead to durability issues if you drop the phone. The G6 is also a fingerprint magnet, so you’ll have to wipe it down often to keep it looking clean. It’s got a dual-camera setup on the back along with a flash module and a fingerprint scanner that sits below it. The scanner doubles as the power button, which is something that takes getting used to. The volume keys are on the left side, while the right edge only features the SIM card slot. The LG G6 offers more color options than the OnePlus 5T: Ice Platinum, Mystic White, or Astro Black. As always, there’s no real winner when it comes to design. Both smartphones have gorgeous bezel-less designs, but are very different. If glass is your thing, you’ll love the G6. If you are more into metal, than go with the OnePlus 5T. The OnePlus 5T is similar to its predecessor when it comes to specs. The major differences are a larger 6-inch Full HD+ display — up from 5.5 inches — and the popular 18:9 aspect ratio we’ve seen on a lot of smartphones this year. The flagship is powered by the latest Snapdragon 835 chipset and comes with either 6 or 8 GB of RAM. It offers 64 or 128 GB of storage that can’t be expanded. A 3,300 mAh battery keeps the lights on and supports the company’s Dash Charge tech, which promises a day’s power in half an hour. It’s one of the fastest charging technologies on the market and should get the battery up to 100 percent in around 90 minutes. Like the OnePlus 5, the 5T is equipped with 16 and 20 MP cameras on the back that allow you to take those fancy bokeh images. However, the second sensor now sports a larger f/1.7 aperture for improved low-light performance. The front-facing camera remains the same at 16 MP but should capture better selfies at night, as the screen can flash to provide additional light. The OnePlus 5T also has dual-SIM capabilities and supports facial recognition, which gives you another way to unlock the device. Of course, it’s probably not faster than the fingerprint scanner because you have to turn on the screen before using it. 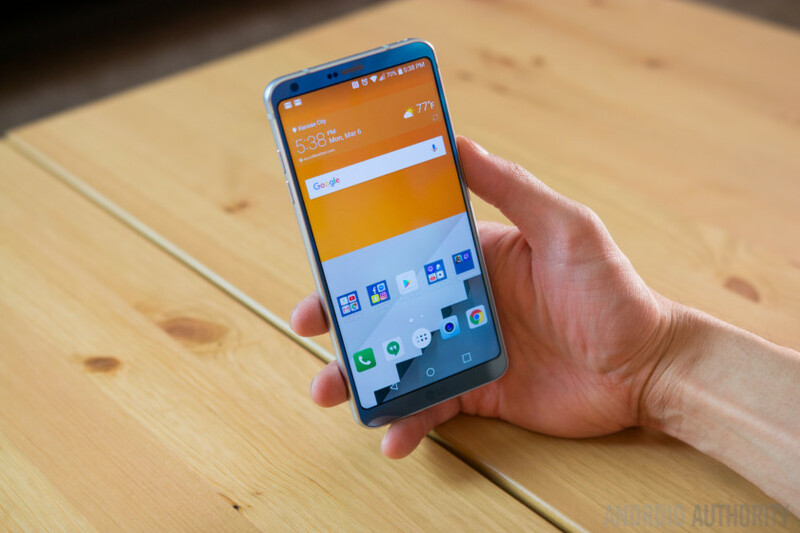 The LG G6 comes with a smaller 5.7-inch 18:9 display that has a higher QHD+ resolution. The handset comes with high-end specs but has less power under the hood than its rival — it packs in the Snapdragon 821 chipset and 4 GB of RAM. Nevertheless, it should handle anything you throw at it and there shouldn’t be a major difference in performance between the two devices. The G6 sports 32 or 64 GB of storage — depending on the market — and you can add up to an additional 256 GB with a microSD card. The device is also equipped with a dual-camera setup, which is different than the one found on the 5T. It features a 13 MP standard angle lens with an f/1.8 aperture and 71-degree field of view, and another 13 MP sensor that sports an f/2.4 aperture and 125-degree field of view for capturing more in your images. There’s also a 5 MP selfie snapper on board. Unlike its rival, the G6 is IP68 rated, so it will survive in up to five feet of water (1.5 meters) for a period of 30 minutes. It also supports wireless charging, although the feature is limited to the US version of the device. The OnePlus 5T wins this round in terms of power because of its faster chipset and 2 or even 4 GB of RAM more. Performance isn’t everything, though. The G6 supports expandable storage, is resistant to water and dust, has a higher resolution display, and offers a standard/wide angle camera combo that’s popular among many. The 5T’s perks include a larger display, faster charging technology, facial recognition, and dual-SIM support. The OnePlus 5T and LG G6 both run Android Nougat. However, each device comes with a custom user interface on top of the OS that has a few unique features on board. OnePlus’ OxygenOS is a light skin that doesn’t change the look and feel of Android much, but does offer many useful customization options. One of the best tweaks is that you can switch between capacitive buttons under the display and on-screen software buttons with a simple tap in the settings menu. There are also various screen-off gestures available. You can double tap the display to wake up the device or draw an O, V, S, M, or W to open an app of your choice. Additionally, OxygenOS offers a Reading Mode that filters out blue light for a more enjoyable reading experience, a Gaming Do Not Disturb Mode which turns off unnecessary notifications while gaming, and much more. LG’s UX 6.0 doesn’t offer as many customization features, but there are a few gestures and other tweaks possible. The LG UI is much lighter than older LG skins but still heavier than Oxygen OS. By default, it doesn’t have an app drawer, but you have the option of enabling it in the settings. The app icons have a dark background with rounded corners for a uniform look, which is a good or a bad thing depending on who you ask. If you’re not a big fan of the design, you can thankfully remove the dark backgrounds in the settings. One of G6’s best features is Grid Shot, which lets you combine four images captured with the camera into one. You can also select various pictures from your gallery to create unique wallpapers, with a new one appearing on the screen each time you wake it up. Other features include Double tap to wake, and Extended Screenshots which allows you to take a screenshot of a long article with a single tap. The LG G6 also has an excellent always-on display that gives you large icons for gmail and other apps, letting you know what’s going on even without fully turning on the display. The two skins are very different, so it’s hard to proclaim one as the ultimate winner. It’s also worth pointing out that both smartphones should be upgraded to Android 8.0 Oreo soon. The OnePlus 5T will cost the same as its predecessor in the UK and the rest of Europe but will be $20 more expensive in the US. This means the 64 GB version will set you back $499/€499/£449, while the 128 GB model will retail for $559/€559/£499. The flagship will go on sale in the US and Europe starting on November 21 via the company’s website. The unlocked version of the G6 with 32 GB of storage launched in the US back in May and was listed at $699 on LG’s website. In Europe, pricing varied from country to country. The good news is that the smartphone’s price has come down since its launch. You can currently get it for just $470 on Amazon, making it $30 cheaper than the entry-level OnePlus 5T. Keep in mind it comes with less storage and has less power under the hood, but you also get waterproofing and expandable storage in exchange. The OnePlus 5T and LG G6 are great devices, but there are many differences between them. The 5T is made of metal, while the G6 has a glass back and a metal frame. OnePlus’ flagship also has a bit more power, a larger screen, supports Dash Charge, and comes with a more stock-like UI. The G6 might have a smaller screen, but that might not be a bad thing. It makes the device more compact and easier to use with one hand. The handset is also waterproof, supports wireless charging, has a microSD card slot, and is cheaper. Ultimately it comes down to whether you want glass and a smaller form factor, or metal and a bigger screen. Neither option is a bad one. Which device would you choose? Let us know in the comments.